Close your eyes. Dream. You are free to dream what you wish. To be the owner of your destiny. Dream that the speculation is dissipated to give way to collaboration. Dream that collective desires replace the egocentric individualism. Dream that cronyism disappear; that technological ignorance that excludes in an unfair and arbitrary way the Free Software to benefit Proprietary Software disappears, and especially when this decision follows the High Economic Value – Transnational pattern. Follow with your eyes closed. Yes, it’s possible. We can change things, we can build a new business ethics, we can change the reality. Imagine a science in the service of humanity. An economy that meets efficiency and justice patterns. A policy that allows us to advance in levels of democracy and solidarity. Open your eyes now. Not only it is possible, it is real. Change your dreams into reality. It depends on all of us. It is possible, it is real. 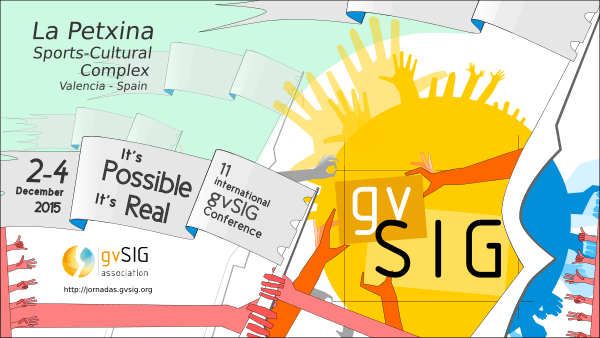 Hold together the #11gvSIG like always, a space for exchange of ideas and experiences where economics, science and politics shake hand, because remember, gvSIG is not just science. This entry was posted in english, events, opinion. Bookmark the permalink.